That is so sweet and so beautifully done! What a great sentiment too! What a pretty card. Everything about it is just perfect! HOW SWEET Amy such a cutie pie, and your coloring is fabulous!!!! Awww..how adorable!! 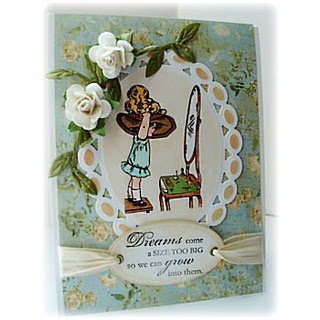 Love this card..so sweetly colored, too. Nicely done, Amy. Amy this is fabulous! Love the coloring. What a great card- this is such a sweet image! our colors are perfect- great release this week! CUTE image but I mainly admire your beautiful, very stylishly vintage design. It almost looks like an authentic card from times gone by...so heartwarming.